Miriam Elizabeth (Betty Lane Brown) was born in Paris, Kentucky on October 10, 1922; however, she never lived there. She, her three brothers and a sister grew up in Olive Hill, KY where they lived until Betty was seven. Her father worked in a bank until it closed during the Depression. Then, the whole family moved to Masontown, West Virginia, a small town near Morgantown, WV. It was here that Betty’s father found a job as a bookkeeper in a limestone company. The families in Masontown were mainly immigrants employed in the coal mines. This was not a difficult move for Betty because there were many children to have playmates. She has a fond memory of picking strawberries there. Another is jumping on the running board of cars as they came down the hill. That is, until her mother found out! Betty’s mother was a Catholic; her father was a non-church going Protestant. “We had to walk two miles to church and didn’t have Mass every Sunday because the priest had several parishes. My mother was a teacher before she married and taught us children at home when we lived in Olive Hill. When we moved to Masontown, we were able to attend public school. The Sacred Heart Ursulines came from Morgantown, WV on weekends to teach us CCD.” Marguerite, Miriam’s mother, loved to quilt and let the children have a good time while cutting out quilt pieces for her. Betty and her siblings all had scarlet fever when they were young. Betty had the worst case, and needed to be quarantined for six weeks. She was very fortunate not to have any heart problems as a result. Through this ordeal Betty does not remember ever seeing a doctor. Each summer Carl, Betty’s father, would take his wife and the children for the entire summertime to visit her mother and their grandmother in Carlisle, KY. He would then return to work in WV until he picked them up at the end of the summer. After her grandmother died, Betty, her brothers and sister would go every summer to Carlisle, KY, near Paris, to visit their Aunt Lil. The family didn’t see much of her father’s relatives because they lived at a distance in Ohio. When Betty was seventeen, she took her younger sister Barbara to Ohio for a month’s happy visit with her dad’s family. It was while visiting Aunt Lil in Carlisle, that they took trips to Lexington, KY where Miriam met the Sisters of Charity of Nazareth. Betty had known for some time that she wanted to be a nurse. Her aunt and uncle suggested that she go to nursing school in Lexington, which would be close to them. Betty’s uncle had been a patient at St. Joseph Hospital and had met Sr. Margaret Hayden. Betty went to St. Joseph Nursing School where Sister Robert Ann was the director of the nursing program. Miriam made many lasting friends there. Among her best friends were Sally Griffin, her roommate, and Elizabeth Toohey. Sally’s sister “adopted” Miriam and treated her as her own sister. After completing her training, she worked at St. Joseph Hospital in Lexington for several months. Sister Thomas de Sales Bailey was a positive influence on Miriam while she was there. From Lexington she moved to Dover, OH and worked in a hospital where her roommate Elizabeth Toohey was working. While there, she saw the first injection of penicillin. Already thinking of entering the community, Betty received a phone call from Sally Griffin telling her to pack her bags; “they” were going to the Novitiate. Her mother could not believe it. Betty entered the community in 1944 and received the name Miriam Elizabeth when she received the habit. 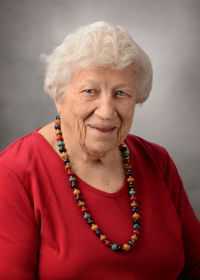 She experienced many good role models – among them Sisters Emily Ann Appleton and Patricia Kelly. The first assignment for Miriam was St. Joseph Infirmary in Louisville where she ministered for eleven years in obstetrics. From here she moved on to Little Rock, Arkansas where she worked in obstetrics, did night duty and general medical. Carl Brown died in 1947 and this was difficult for Miriam who had been very close to her father. Miriam’s next assignment took her to St. Joseph Hospital in Lexington for two years where she did all types of nursing. There was no pharmacist on duty at night, so she filled this role when necessary. Working in the maternity department at Flaget Memorial Hospital in Bardstown was her next assignment for five years. Holy Family Hospital in Ensley, Alabama was next where she was the supervisor of nursing services. Leaving Alabama, Miriam returned to St. Joseph Infirmary in Louisville where she was superior for one year and worked as a nurse for two more years. During this time Miriam also studied at Spalding University and earned her Bachelor of Science in Nursing in 1971. Also in 1971 Miriam moved to Eastern Parkway in Louisville, her first experience of living “out” in a small group. It was an adjustment and she missed living in a big group. Dorothy Peterson asked her to come and help with the Mobile Health Unit that had just been formed. Miriam assumed many roles while working there – staff nurse, director of nursing, health care-intake coordinator, patient care coordinator. She worked there from 1971-2005 when she retired because of her eyesight. Upon her retirement, Miriam became a prayer partner for the community. During this time on Eastern Parkway, she helped to care for Sr. Agnes Regina, whose health was deteriorating. Miriam crocheted and tatted until her eyesight prevented this. She says the rosary every morning and evening, listens to the radio for news, and follows basketball and football. In 2013 a bad storm knocked a tree down on the house on Eastern Parkway. Luckily neither she nor Sister Mary Middendorf was injured. They could not stay in the house and moved to the SCN Apartments on the hill on Newburg Road. Several months ago both Miriam and Mary moved to Carrico Hall at Nazareth. Miriam is used to adapting and is in the process of making a new home there. She says happily, “Among my greatest blessings are the friends I have made, and all my ministries which I have liked. I have never been unhappy in religious life.” Miriam is a very positive person, used to adapting to new situations. She likes to go out, and enjoys life. Miriam has one brother and one sister who are still living besides nieces and nephews. She has good health – her mother saw that they ate well and had things they needed. Since moving to Nazareth, Miriam has begun listening to books on tape from the Blind Society. She used to like to read and didn’t think she would like the books on tape. Now she loves them. Her brother and sister are also avid readers. Miriam’s favorite prayer is the Memorare and she says it regularly. Right now Miriam states she is “just waiting”. Miriam was a delightful person to converse with. She remembered many interesting details from her childhood. My Aunt Betty Lane……. This brought tears to my eyes….. So much about the family i had no clue about….I remember her always Happy… Always smiling.. Going to Aunt Uwa’s in Kentucky…Aunt BettyLane was there and would take all us kids and pick blackberries….When she had first became a nun…i remember my dad taking us kids to the hospital she was working at….. at that time alot of the Sisters quarters were off limits…. I was just a young girl at this time.. but was inquesitive about her sleeping quarters….. well she wasnt suppose to let me go in there… but she did and she showed me where she slept and stayed when she was not on duty….. WOW…. THAT REALLY WAS SPECIAL TO ME……Aunt BettyLane genuine loved her brothers and baby sister!!!!!! !She loves her family…..
She has a Genuine Heart….a Genuine Spirit…. I have enjoyed getting to know Sr. Miriam as we traveled to doctors, dentists and airports. She is always a delight and we have had some wonderful conversations. This is a beautiful article about an amazing woman. We are so grateful that your friendSister Sally Griffin, told you ” to pack your bags” and accompany her to Nazareth.We thank you for caring for the sick these many years. Wonderful to read about S. Joseph’s Infirmary days. So few of us left in a very hidden yet blessed and fruitful SCN ministry. IT MAY HAVE BEEN RATHER DIFFICULT FOR MIRIAM AND MARY M. TO COME TO LIVE AT NAZARETH, BUT NEITHER SHOWED ANYTHING BUT CHEERFUL SMILES AND WILLING SPIRITS. I DELIGHT IN CONVERSING WITH BOTH. MIRIAM, WE HAVE A CONNECTION THROUGH SALLY GRIFFIN FROM MY HOMETOWN AND OUR COMMON BIRTHDATE. THOUGH WE HAD LITTLE OPPORTUNITY TO KNOW THE NURSES IN THE PAST, I AND MANY OTHERS, SAY HOW GLAD WE ARE THAT YOU ARE HERE. YOU ARE A DELIGHT. BLESSINGS! I am deeply blessed to call Sister Miriam and so many other wonderful women my sisters. I met Sr. Miriam back in 1978, she was my Mother’s nurse at Nazareth Home Health. This was a year that I will never forget, we had 3 foot of snow on the ground and Sr. Miriam made her way to our house to visit my sweet mother. Mom passed away shortly after her visit. When Sr. Miriam came to Carrico Hall last year, I didn’t remember her, after a short visit, she remembered my Mom, what an experience that was, oh my. I am grateful to have her back in my life at Nazareth! She is a beautiful woman for sure.